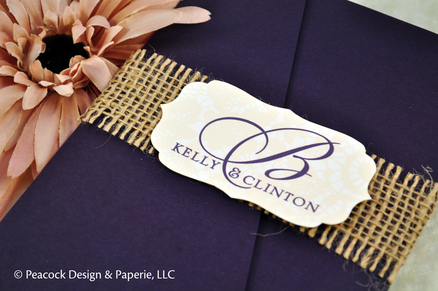 A jute ribbon bellyband adds rustic charm to this pocket folder invitation. We will discuss your budget and design style via phone, email, and/or face-to-face consultation. You can choose one of our existing designs (see the SEMI-CUSTOM DESIGN gallery) with changes to its colors and information. You can also take any of our semi-custom designs and add to it any of our pocket folders, pocket cards, jacket pockets or even just backer cards. If you already have a design idea in mind or just haven't yet found that "perfect" invitation for you, we will create a brand new COUTURE DESIGN created specifically for you. After a consultation, we can provide you with an estimate for your invitation suite as well as a timeline for production. To begin your digital designs, we require a small, non-refundable deposit, which will be applied to your final balance. We enter your project into our schedule and email you a PDF file with your invitation suite laid out for your review. You offer your feedback on the designs and we make any revisions or additions at your request. During the design process, we will send you an artboard that looks like the above image. It shows how all of your pieces look fully assembled and also separate for proofing purposes. 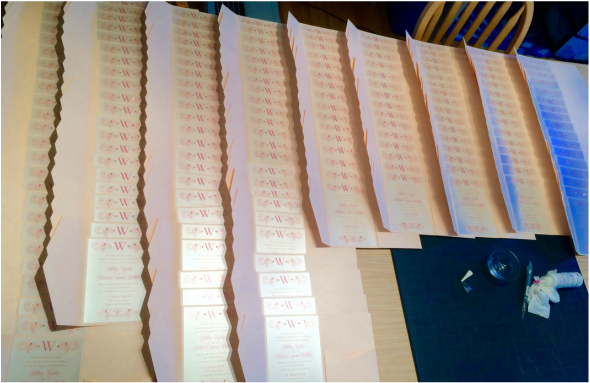 Two Swarovski crystals are assembled by hand to each of these invitations and then laid out to dry. After the design is completed and you are completely satisfied with the look and materials to be used, we will provide your final quote based on the quantity of your order, amount of materials needed, printing services, actual design time, and our estimated time for assembly (if any). All artwork requires your final "sign off" before anything goes to print. Your remaining balance is then required to begin production (to order materials, print, and assemble). Because of the custom nature of stationery, all orders at this point are final and non-refundable because we cannot return your products after this point. We do guarantee satisfaction on our work and craftsmanship. See our client testimonials! On average, it takes 3 1/2 weeks from the time your artwork is finalized to the time you receive your assembled invitations. You may choose to pick up your invitations or have them shipped to you. We can carry over your design from your invitation suite into every other detail of your celebration through a wide variety of stationery products we offer ~ ceremony programs, table & seating cards, favors, signs, signature drink stirrers, thank you cards and much more.